As one of the biggest energy companies in Finland, Helen Ltd (formerly Helsinki Energy) supplies electric energy to over 300,000 customers in different parts of Finland and district heat to more than 90 percent of the buildings in the capital city. The first Nirafon acoustic cleaners adopted at the desulphurization plant of Salmisaari Power Plant (semidry method) in 1987. 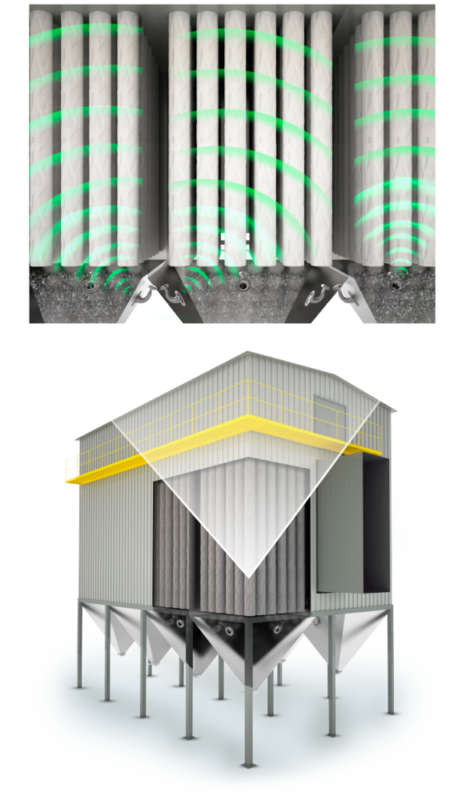 For example one acoustic cleaner inside the recycling dust silo solved all arching problems and there hasn’t been any shut downs for cleaning since then. These acoustic cleaners are still in use. A total of 24 devices were installed for cleaning the lower parts of the bag filters. At first the system was tested with one of two lines. After one month testing approximately 70% of flue gas passed through the line with Nirafon acoustic cleaners. This indicated that the acoustic cleaners kept the bags much cleaner than the reverse compressed air pulse method was capable of by itself. In 1995 four Nirafon NI-250 acoustic cleaners were placed inside the channel between reactors and the bag filters to keep these flue gas channels free from dust. Before the Nirafon acoustic cleaner installation, the temperature transducers were covered by a thick layer of deposit, which strongly deadened the measuring signals and caused problems for process control. By using Nirafon acoustic cleaners these problems disappeared. Earlier, during annual maintenance the cost of the cleaning was approx. 35–50.000 euros each time. Now the cleaning costs only 3.500 per year. In 2000 two Nirafon earlier gas pulse cleaners were installed on the top part of the combustion chamber. Later, these cleaners were replaced with new NCSD® cleaners which where at least as powerful as old ones and the reliability was better. In 2001 four NI-250 acoustic cleaners were installed to keep the air preheater clean. Before the installation of acoustic cleaners, the air preheater was cleaned 1–2 times a year, also during the season. Cleaning took one day work with 4 men and 800 m3 water, costing totally 8.000 euros each time. If the cleaning needed to do during season, the cost of the shut down was many times more than the cleaning itself. After using acoustic cleaners, the air preheater has been washed, because of possible corrosion, during annual maintenance in the summer time once in 3 or 4 years. In the summer 2005 two NI-100 acoustic cleaners were installed to the reactors of the desulphurization plant. Typically, the reactor walls were coated by 30 centimetres thick hard calcium sulfate layer. “We had to wash it with pressured water before annual maintenance, sometimes during operation. As a result of one week job we had ca. 800 m3 sludge and clean reactor walls. It cost us 50.000 euros”, says Operations Manager Rauno Kontro. Right after using Nirafon acoustic cleaners the reactor walls have had maximum few millimetre thick layer of impurities. At the same time two NI-100 cleaners were installed in electrostatic precipitators, which typically clogged couple of times in a year. Now the surfaces stay clean and funnel has not clogged.